The “Avengers” are helping the Elks combat Bullying, Under Age Drinking and the Abuse of Pharmaceutical Drugs. 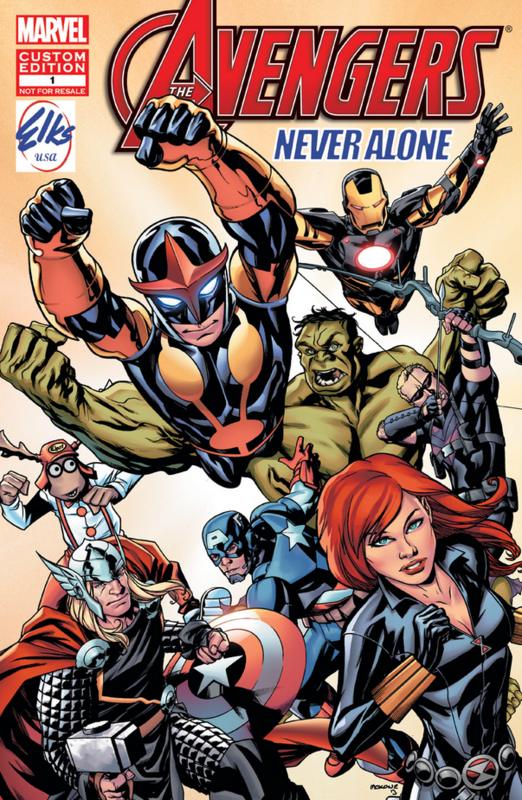 The Avengers battle alien robots to show our children that if are being Bullied and pressured to use Alcohol and Pharmaceutical drugs you can always find help and that you are “Never Alone” because help is available and do not be afraid to ask for that help. The printed version is not yet available but soon will be sent to schools across the country who have requested that Marvel education material be sent to them. Spread the word that you are “Never Alone” and someone will always be ready to help you lead a safe and drug free life. I home school. Can I get a copy of this book? How do I get the form to order these comics for my school?? Hi Danielle, visit http://www.elks.org/dap/contact.cfm and contact your local chairperson in your state. This comic book is a fun & important way to get this important message out to our youth!